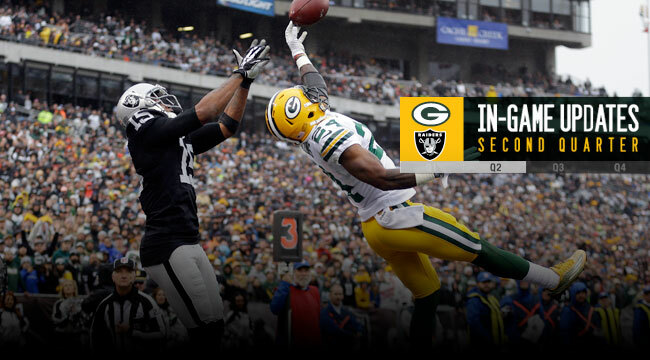 OAKLAND — The Raiders needed just four plays to go 79 yards after a crucial Packers fumble, scoring a TD late in the first half to get within 14-13 at intermission on Sunday at the O.co Coliseum. The second quarter started with the Raiders facing third-and-goal on the 5. QB Derek Carr tried a fade pass to the corner of the end zone to WR Michael Crabtree, but rookie CB Quinten Rollins broke it up, leading to a 23-yard field goal by K Sebastian Janikowski to pull the Raiders within 14-3. The Raiders defense then responded with its second sack of QB Aaron Rodgers on the day, this one by LB Ben Heeney. Rodgers then tried to go deep to WR Davante Adams but couldn’t connect, forcing a punt. Oakland cut into the deficit further with another Janikowski FG, this one from 30 yards out. RB Latavius Murray had runs of 10, 22 and 5 yards, and Crabtree caught passes of 5 and 23 yards, but the Packers defense held in the red zone. Green Bay led 14-6 with 8:36 left in the half. The Packers offense still couldn’t get going, gaining one first down on a 7-yard pass to WR James Jones. But a third-down pass to TE Richard Rodgers came up one yard short, and the Packers had to punt again. The Packers defense answered with a strong series, forcing a three-and-out, but Raiders P Marquette King pinned Green Bay on its own 2-yard line with a 60-yard punt, backing the Packers way up with 4:58 left in the half. The offense got a big break on the next series, as Raiders CB TJ Carrie was called for a highly questionable pass interference call against WR Randall Cobb on third down from the Green Bay 7-yard line, keeping the drive alive. Rodgers then scrambled and found Cobb for 23 yards to convert the next third down, and he escaped pressure to find TE Justin Perillo to convert another third down. That put the ball on the Oakland 40 at the two-minute warning. Two plays later, RB James Starks fumbled the ball, getting it ripped out by DE Benson Mayowa after taking a big hit from S Charles Woodson. Mayowa recovered at the Oakland 21-yard line with 1:22 on the clock. The Raiders wasted no time, gaining 29 yards on a screen pass to RB Marcel Reese, 14 yards on a pass to TE Mychal Rivera, and 17 yards on a scramble by Carr. On the next play, Carr hit WR Amari Cooper for a 19-yard touchdown, and Janikowski’s extra point pulled the Raiders within 14-13 with 20 seconds left in the half.